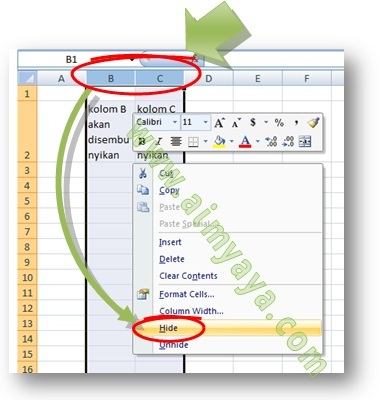 We could use the hide facilities provided by Microsoft Excel to hide rows or columns so that rows or columns will not appear on screen or when we printed the document. With hiding columns or rows, we only change the visibility but the data will still remain there. So you can still use it to your formulas. It's just that the data will not appear either on the screen or on paper when printed. To hide columns or rows you can use the following steps. Select the columns or rows to be hidden . If you want to hide the column then right click on the column header, whereas if you want to hide a row then right click on the header row to be hidden. Next on the popup menu that appears select the Hide items. The columns or rows that you selected earlier will instantly be hidden. Block cells that contains rows or columns to be hidden. Click Hide rows item if you want to hide the selected rows, or click Hide columns item if you want to hide the selected columns. To hide quickly, you can use the CTRL+9 for hiding rows or CTRL+0 for hiding columns. After hiding column and rows you will see a “jump” of rows or columns index . If you want to undo it then you can immediately press CTRL+Z.